Perfect Travel and Sport Towel for Life's Adventures! 100% microfiber towel was designed with travelers, outdoor lovers, or gym gurus in mind! - The microfiber material is super absorbent, quick-drying, and ultra compact. - Perfect for suitcases, carry-ons, and gym bags. - Towel and washcloth both have hooks perfect for hang drying. 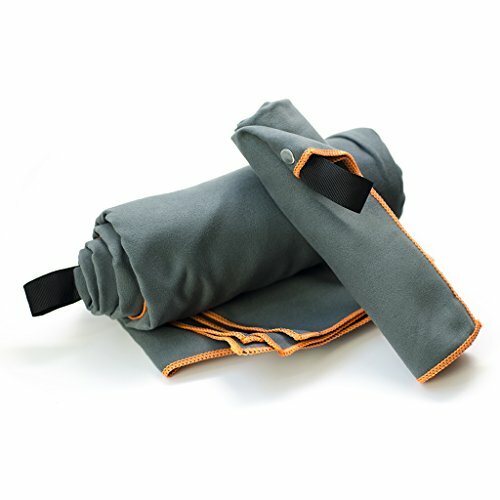 - A lot of users love the full body towel for yoga mats or drying off after a swim in the river. - The washcloth is a perfect size for a face towel during a workout, or perfect to scrub away dirt from a hike. Not happy? Contact us and we will refund 100% of your money! Click "Add to Cart Now" to purchase! GET INTO SHAPE with this great MULTI-USE TOWEL! Perfect for sweating it out at the gym, hiking and swimming outdoors, or traveling around the world! DON'T WORRY ABOUT WET LUGGAGE: Our towel is designed to be extra absorbent and fast drying, so you can pack it up and get back to those adventures. LIGHTWEIGHT AND EASY TO PACK: This towel packs up nice and small so it fits into suitcases, gym bags, and carry-ons! WORLD TRAVELING: We've testing our microfiber towel all around the world to make sure it is perfect! We've used it at yoga, after an intense run, or after a dip in the ocean! If you have any questions about this product by Swan and Goose, contact us by completing and submitting the form below. If you are looking for a specif part number, please include it with your message.